- Ask about Tom's lower listing fees!! - Find Out How Much Your Home is Worth! Call Tom at 303-517-4700 or fill out the form by clicking on the Your Home's Value tab for a complimentary market analysis and find out how much your home is worth in today's market. Ask about Tom's Cash-back rebates!! If you are thinking of buying, call or email Tom and he would be happy to provide you with a list of homes that match your price range, desired areas and desired features. Of course, he would also be happy to show you any properties that may be of interest to you. Talk to Tom! Serving Green Mtn., Lakewood & the Denver Metro Area. Real Estate Excellence Since 1995. Immaculate Update home Backing to Grass Field! SOLD! IMMACULATE MOVE-IN CONDITION HOME IN PRIME LOCATION! BACKS TO BEAUTIFUL PARK AREA. MOUNTAIN VIEWS FROM THE FRONT. HUNDREDS OF THOUSANDS IN UPDATES AND UPGRADES - INSIDE AND OUT! BONUS ENCLOSED PORCH, SUNROOM AND GAZEBO. VIRTUALLY EVERYTHING IN THIS HOME HAS BEEN IMPROVED - WAY TOO MUCH TO LIST. 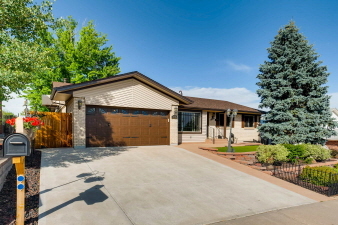 THIS IS A SPECIAL HOME LOADED WITH FEATURES & UPDATES. SIMPLY A MUST-SEE!! Talk to Tom! It's the Right Move.